Lt-General A K Bhatt has been appointed by The Appointments Committee of Cabinet (ACC) as the new director-general of military operations (DGMO). The Indian Navy has formally inducted four types of indigenously developed sonars ABHAY,HUMSA UG,AIDSS,NACS to boost underwater surveillance capability. The Defence Research and Development Organization (DRDO) successfully conducted proof firing tests of Armament system for 155 mm x 52 calibre New Advanced Towed Artillery Artillery Gun System (ATAGS) at Proof & Experimental Establishment (PXE) in Balasore, Odisha. The 25th edition of World’s largest international maritime exercise named RIMPAC (Rim of the Pacific) 2016 began in Pacific Ocean at Hawaii, United States. Twenty-seven nations, 45 ships, five submarines, more than 200 aircraft and 25,000 personnel will participate in the biennial Rim of the Pacific exercise scheduled, June 30 – Aug. 4, in and around the Hawaiian Islands and southern California. GRSE(Garden Rich Ship Building Engineers),Kolkata has successfully developed INS Tarasa, the fourth and last ship in the series of the Water Jet Fast Attack Craft (WJFAC). India became the 35th full member of the Missile Technology Control Regime (MTCR).The aim of the MTCR is to restrict the proliferation of missiles, complete rocket systems, unmanned air vehicles, and related technology for those systems capable of carrying a 500 kilogram payload at least 300 kilometres, as well as systems intended for the delivery of weapons of mass destruction (WMD).The regime was formed in 1987 by the G-7 industrialized countries (Canada, France, Germany, Italy, Japan, the UK, and the United States). Indian Air Force (IAF) became the first air force in the world in possession of a supersonic cruise missile system “Brahmos” with a long range fighter aircraft SU30 MKI. The 20th Edition of Trilateral Naval Exercise MALABAR between India,US & Japan has commenced in South China Sea from 10th June 2016.The 20th edition of the exercise, Ex MALABAR-16, is being conducted from 14 to 17 June 16 with the harbour phase at Sasebo from 10 to 13 June 16 and the sea phase in the Pacific Ocean from 14 to 17 June 16. The primary aim of this exercise is to increase interoperability amongst the three navies and develop common understanding of procedures for Maritime Security Operations. India has Developed the State of the Art Indigenous Submarine Assembly Workshop at Mazgaon Docks Limited(MDL),Maharashtra at a cost of Rs 153 Crore. Indian Air Force(IAF) has Successfully Test Fired Land Attack Version of Supersonic Cruise Missile Brahmos at the Pokharan Test Firing Range,Rajasthan. Brahmos is a 2 Stage(Solid propellant Booster & Liquid Fueled Ramjet) Fire & Forget Cruise Missile that can Reach Targets upto 290 KM at Supersonic Speed of Mach 3. India has successfully test fired nuclear capable Prithvi-II surface-to-surface missile with strike range of 350 km from Integrated Test Range at Chandipur in Odisha. Defence Research and Development Organisation (DRDO) has test fired Advanced Air Defence (AAD) interceptor missile, Ashwin from the complex of Abdul Kalam Island (formerly known as Wheeler Island) in Balasore district off Odisha coast. Indian Air Force has launched its Electronic Maintenance Management System (e-MMS) Project, an automated military maintenance system which is one of the largest Maintenance Repair Overhaul (MRO) IT implementation in the world with Systems Integrator Wipro. Indian Navy has launched the state-of-the-art Harbour Defence Systems,Integrated Underwater Harbour Defence and Surveillance System (IUHDSS) & Mine Warfare Data Centre (MWDC) in Visakhapatnam, Andhra Pradesh. Indian Navy has decommissioned its fleet of Sea Harriers Aircrafts at a function organised at INS Hansa base in Vasco, Goa. 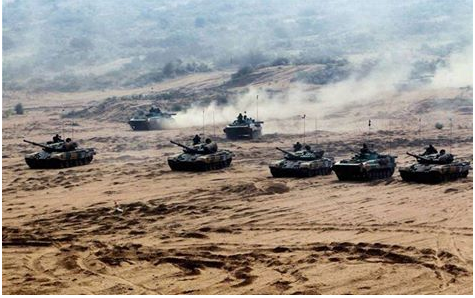 Indian Army has conducted major military training exercise ‘2016 Chakravyuh-II’ Pallu – Sardarsahar (Suratgarh, Rajasthan) in conjunction with the Indian Air Force (IAF). Goa Shipyard Limited (GSL) has launched Indian Coast Guard Offshore Patrol Vehicle (ICGS Shaurya) at Panaji. 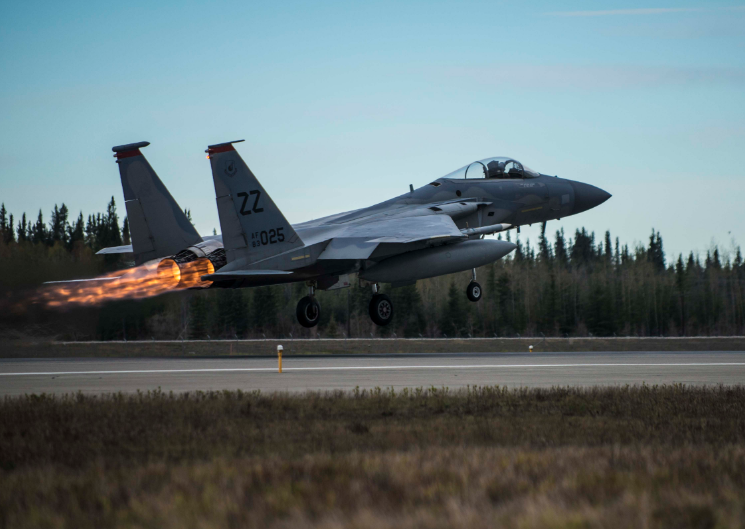 Indian Airforce Participated in Air Force Exercise RED FLAG ALASKA at Joint Pacific Alaska Range Complex (JPARC), the largest instrumented air, ground and electronic combat training range in the world in EIELSON AIR FORCE BASE, Alaska.Indian Contingent Includes 4 Su-30MKI fighter aircrafts from Sirsa AB, India; 4 Jaguar attack aircrafts from Ambala AB, India & 2 IL-78MKI refueling aircrafts from Agra AB, India. INS Kalvari(S50),The First of Scorpene Class diesel-electric attack submarine which is designed under Technology Transfer from French naval defence and energy company DCNS by Mazagon Dock Limited in Mumbai has Commenced First Sea Trials for Navigation & Propulsion Systems. Indian Navy has decommissioned Naval Ships ‘Veer’ and ‘Nipat’ at the Naval Dockyard,Mumbai.The ships played a significant role as the guardian of International Maritime Borderline off west coast of India and were extensively deployed during the Operations Vijay and Parakram. 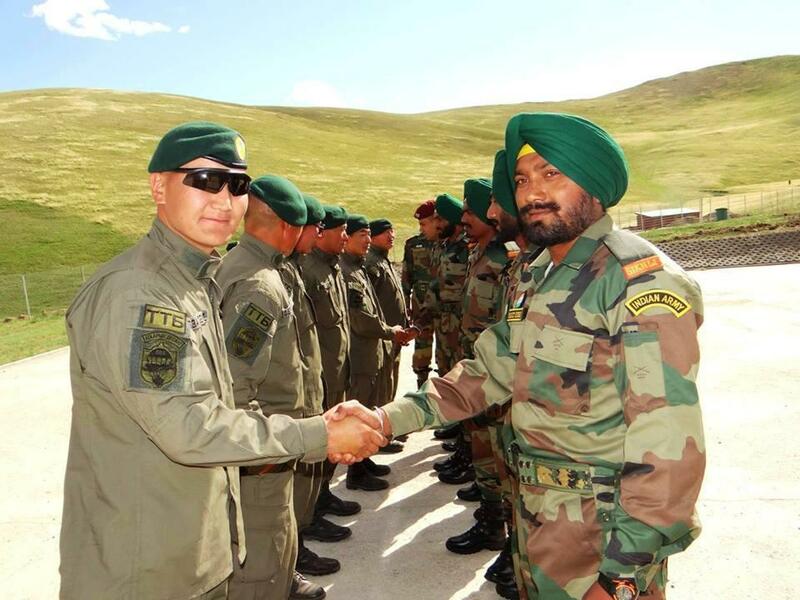 The 11th Edition of Indo-Mongolia Joint Military Exercise “NOMADIC ELEPHANT-2016” has Commenced in Mongolia.The aim of this exercise is to develop synergy and inter operability between the two armies to fight in Counter Insurgency and Counter Terrorism environment under the United Nation mandate.A platoon of the Kumaon Regiment of the Indian Army alongwith a team of two observers will be taking part in the event. From the Mongolian Armed Forces, a total of 60 personnel will take part in the exercise. 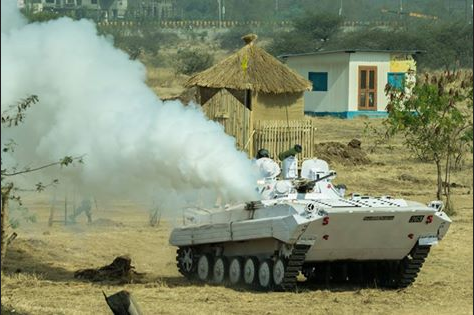 Indian Army has Conducted Field Training Exercise “Shatrujeet” in Rajasthan under aegis of Mathura based Strike Corp 1.This Operationally Focussed Exercise was organised in Mahajan Field Firing Range,Rajasthan With Sole Aim To Strike Deep into Enemy Territory With Integrated Land-Air Coordinated Systems. India has Indigenously Developed VARTM based SONAR DOME for Anti-Submarine Warships.This has been Developed by RDE Wing,DRDO,Pune and Goa Based Composite Manufacturing Company Kineco Ltd.It was Inaugurated by Defence Minister manohar Parrikar in DefExpo Goa 2016. Ministry of Defence has released new Procurement Policy DPP(Defence Procurement Procedure 2016) which is set to replace DPP 2013 with Emphasis on Make in India Initiative. India’s 9th Biggest 4 Day Biennial Land,Naval & Air Defence Exhibition Started in Goa.DefExpo 2016 Goa has theme “Rise of Futurism” with participation of 1053 Companies from 47 Countries. Gyan Chakra is the name of a new think tank on Defence and Strategic Affairs formed by the Army’s Western Command. It will provide a platform to army veterans and thinkers to pursue research on strategic and national security issues. It has been established as an extension of the Khetarpal Officers Institute (KOI), Chandimandir. The Indian Air Force (IAF) has conducted its flagship day-night exercise ‘Iron-fist 2016’ at Pokhran firing range in Rajasthan. 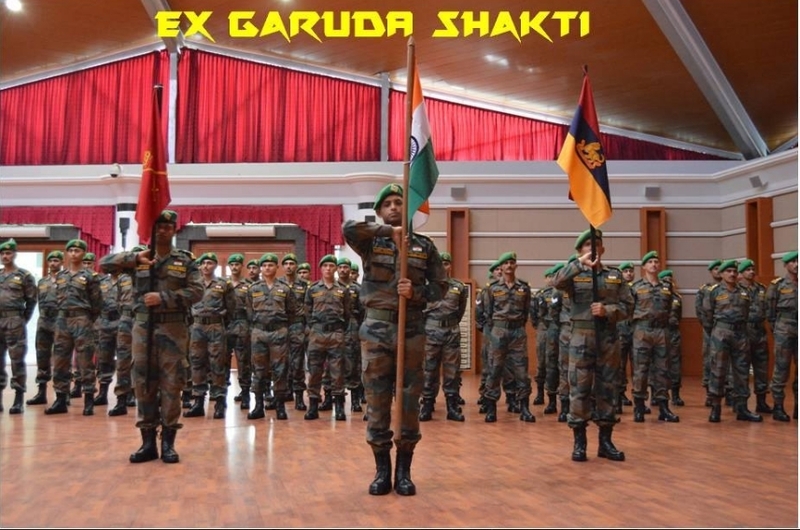 The 4th Edition of 13 Days India-Indonesia Joint Military Training Exercise “GARUDA SHAKTI” Commenced in Magelang,Indonesia. The Chief of army staff, General Dalbir Singh, on behalf of the President of India Pranab Mukherjee, presented the ‘Standard’ to 18 Cavalry at Amritsar.18 Cavalry is a frontline regiment of the Indian Armoured Corps. 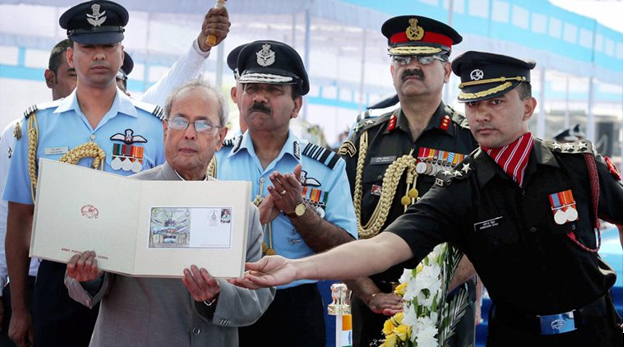 President Pranab Mukherjee awarded the Presidential Colours to 28 Equipment Depot and Presidential Standard to 119 Helicopter Unit at a ceremonial parade held at Air Force Station Jamnagar.The two units of the Indian Air Force that included a helicopter unit based in Jamnagar, Gujarat that had played a major role during the August 1999 “Atlantique Crisis” and the November 2008 terrorist attack on Mumbai. The CCS(Cabinet Committee on Security) chaired by Narendra Modi on 1st March 2016 cleared the proposal to acquire two more Phalcon Airborne Early Warning and Control Systems (AWACS) at a cost of Rs. 7,500 crore under a tripartite agreement with Israel and Russia. Multinational Field Training Exercise (FTX) – Exercise FORCE 18, involving ASEAN Plus countries commenced as a part of the Look East policy in Pune from 01 March 2016 on Humanitarian Mine Action (HMA) and Peace Keeping Operations (PKO).The Indian Army contingent of 40 soldiers is being led by Lt Col Sophia Qureshi, a Woman Officer from the Corps of Signals, who now has the rare distinction of becoming the first woman officer to lead an Indian Army training contingent in such a large multinational exercise. The 7th edition of India, Seychelles joint military exercise LAMITYE 2016 concluded in Victoria, Mahe Island, Seychelles.It was conducted between the Indian Army and the Seychelles People’s Defence Forces (SPDF) from 15 February to 28 February 2016.Lamitye in Creole (local dialect of Seychelles) means friendship. The exercise is conducted biennially with the aim of enhancing military cooperation and interoperability between the Armed Forces of two countries. Vice Admiral Atul Kumar Jain,AVSM,VSM took over as the Chief of Staff of the Visakhapatnam headquartered Eastern Naval Command. He succeeds Vice Admiral Bimal Verma who has been transferred as Commander-in-Chief of Andaman & Nicobar Command at Port Blair. Former DRDO Director-General (DG) Dr Avinash Chander has been awarded prestigious Aryabhata Award of Astronautical Society of India.Avinash Chander was the chief architect of India’s strategic Agni series of ballistic missile systems and famously is known as Agni man of India. The Union Government has appointed Rajendra Singh as the Director General (DG) of Indian Coast Guard (ICG), country’s coastal protection force.With this appointment, Rajendra Singh becomes first DG of ICG from its own internal cadre since it was set up in 1978. So far this top post was only held by officers who were commissioned in the Indian Navy. The fifth edition of IBSAMAR 2016 trilateral naval exercise between Brazil, India and South Africa kicked off in Goa. IBSAMAR is abbreviated as India-Brazil-South Africa Maritime.Indian navy is represented by INS Mumbai– a missile destroyer, INS Shalki– a Shisuhumar class diesel electric submarine and INS trishul– a stealth frigate. 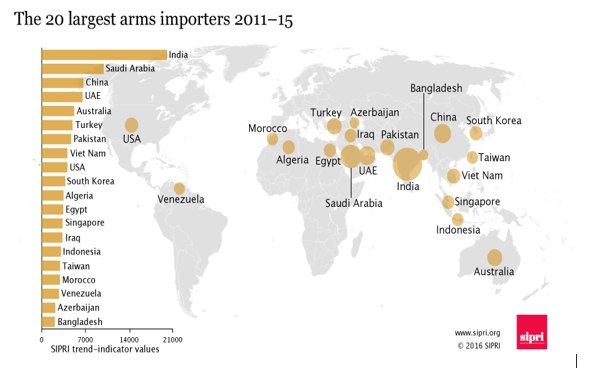 Stockholm International Peace Research Institute (SIPRI) has revealed India(14%) to be World’s Largest Arms Importer followed by China (4.7%), Australia (3.6%), Pakistan (3.3%), Vietnam (2.9%) and South Korea (2.6%). 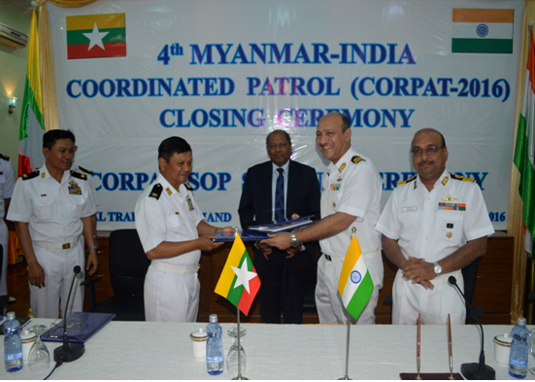 The fourth edition of the India-Myanmar Coordinated Patrol (IMCOR) was successfully undertaken from February 13 to 16, 2016 along the International Maritime Boundary Line (IMBL) in the Andaman Sea. Indian Navy Ships Saryu and Bitra along with Union of Myanmar Ships Aung Zeya and FAC 563 participated in the 4th IMCOR. Cmde Girish Garg, Naval Component Commander from the Tri-Service HQs in Port Blair was embarked onboard INS Saryu. Defence Research and Development Organisation (DRDO) has decided to conduct captive flight trials of an advanced, state-of-the-art Anti-Radiation Missile (ARM) in April-May 2016.ARM has range of 100 to 125 km and will be mounted on combat aircraft Sukhoi (Su-30) and Tejas-Light Combat Aircraft (LCA). India participated in Cobra Gold 2016 multilateral amphibious exercise which is the largest Asia-Pacific military exercise held annually in Thailand. Indigenously developed Prithvi-II missile developed under IGMDP was successfully test fired from the Chandipur, off Odisha coast.It is surface-to-surface medium range ballistic missile with a strike range of 350 km. India’s first indigenously developed lightest revolver (gun) Nidar weighing merely 250 grams was successfully launched.It has been developed by Rifle Factory Ishapore located in West Bengal giving boost to the ‘Make in India’ initiative in small manufacturing sector. Vice Admiral Sunil Lanba took over as Flag Officer Commanding-in-Chief (FOC-in-C) of Mumbai headquartered Western Naval Command (WNC) at a ceremonial parade held at INS Shikra. Indigenously-built surface-to-air Akash missile was successfully test fired from complex-3 of the Integrated Test Range (ITR) at Chandipuri in Odisha.It can engage aerial targets up to a range of approximately 25 kms. The Union Cabinet has approved proposal of raising of 17 Indian Reserve Battalions (IRBs) in Jammu & Kashmir and 4 Left Wing Extremism (LWE) affected states. i-tank missile Nag was successfully test fired at Mahajan Field Firing Range in Rajasthan.Using HEAT (High explosive anti-tank) warhead, the top-attack all-weather fire-and-forget system is capable of destroying modern tanks with armoured protection by nullifying their ERA (explosive reactive armour). Indian Army Day is being observed every year on 15 January in India. This year it will be the 68th Indian Army Day. Significance of Day: On this day in 1949, Lt. General (later Field Marshal) Kodandera Madappa Cariappa became the first Indian Commander-in-Chief of the Indian Army (of the independent India) by succeeding British Army General Francis Butcher (last British Commander-in-Chief of India.). Jacob-Farj-Rafael “JFR” Jacob (Retired Lieutenant General), a key architect in India’s victory in 1971 Bangladesh Liberation War passed away in New Delhi. He was 92. 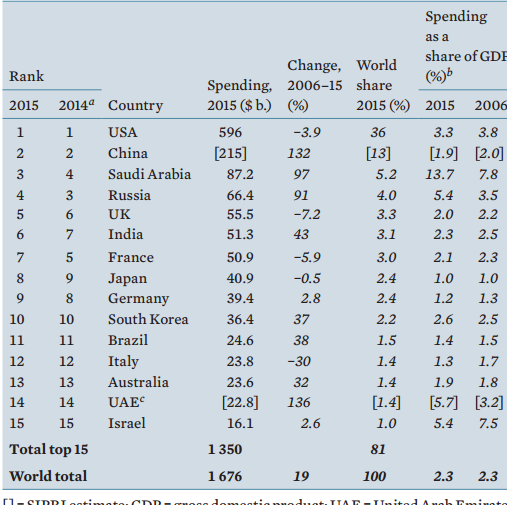 I have Tried to Update This Page with Latest Military Defence News of India.The Military Current Affairs have been linked to appropriate newspapers for further reading on the topic.Feel Free to Share this Document or Save this Using Online Document Conversions.